At Elizabeth Wallace Bridal we can help make your wedding day as wonderful as you always dreamed by fitting your gown to perfection, so you feel truly beautiful, confident and elegant. With meticulous attention to detail, we will expertly alter your wedding dress to fit you impeccably and flatter your individual shape. Every bride is special and we promise to give you outstanding individual care and attention, from your very first fitting with us, to the exciting moment when you collect your dress. At your initial consultation, we’ll discuss all aspects of the couture process with you. We’ll listen carefully to your thoughts and concerns, put you at ease and offer you an enjoyable and memorable experience in the build up to your special day. Where possible, we recommend a first consultation three months before your wedding day, particularly during our busy period of May through to July. We want you to feel sensational in your dress and delighted with the alterations, so we like to leave enough time for further fittings and final adjustments, just in case. Perhaps you’ve found a gown, but it’s just not quite how you would like it? We can turn it into the wedding dress of your dreams by careful and professional restyling, such as changing a neckline, creating a sleeve, adding more detail or even making things simpler. You can bring your own ideas along to your appointment or let us suggest how we can make stunning finishing touches. Together we’ll create the perfect bridal look just for you. We’d love to play a part in your special day and look forward to welcoming you to our specialist boutique in Kilmarnock. Come alone or make it a social event by bringing along the ladies from your bridal party. 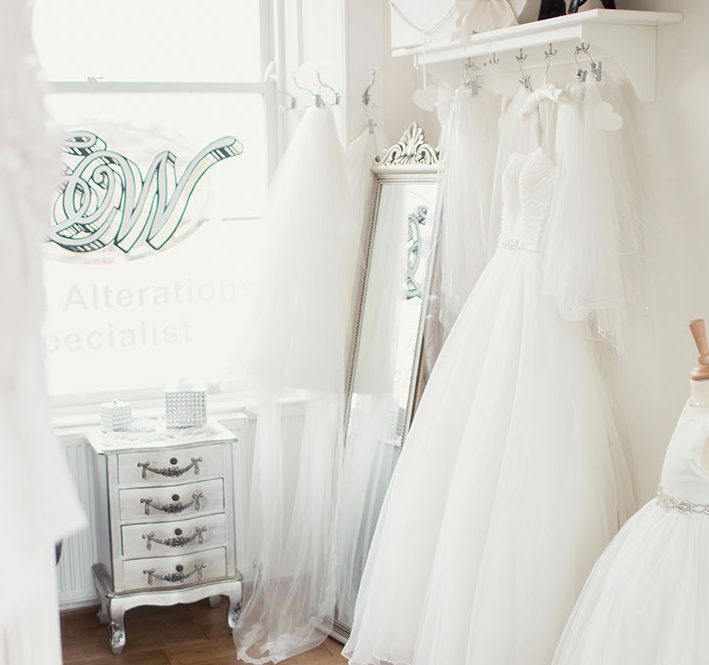 Our consultation rooms are bright and comfortable, creating just the right environment for your bridal fitting.